Club Dobrila Marina is unique open air river club, located on the right shore at Sava River, at Brodarska Street, right next to Gazela Bridge. Charm of this river club is like a perfect place for fun and wonderful moments that will allow you to cool off during a day, relax with excellent music and charge your batteries for the upcoming evening. At river club Dobrila Marina you would be able to listen to best Djs and bands. 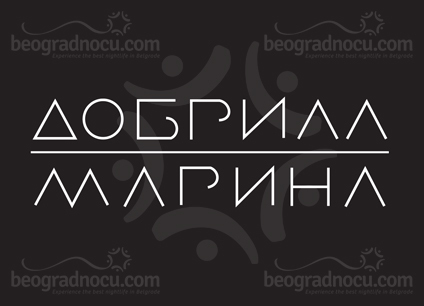 Be a part of most popular entertainment in Belgrade and visit club Dobrila Marina. River club Dobrila Marina is offering to you top selection of cocktails as well as list of most quality wines that will keep you in balance with energy of program and positive people at river club Dobrila Marina. River club Dobrila Marina is opened from 10 am until 4 am in the morning. Music program at river club Dobrila Marina is mostly pop and rock. Mtv hits, Vh1 hits, jazz, funk, house, groove and everything that awakes positive in people. Club Dobrila Marina accommodates 180 people. This club will keep up with high standards of best entertainment in Belgrade with maximally heat up atmosphere, pleasant ambient decorated at very modern and sophisticated way. Atmosphere at river club Dobrila Marina is unique with positive energy. At river club Dobrila Marina prices are very affordable and correct and staff is always ready to serve you. At club Dobrila Marina you can experience top entertainment and enjoy with you favorite persons. River club Dobrila Marina will be your favorite place this summer and it will represent summer version well known club Dobrila. If you were fan of hot nights in club Dobrila, river club Dobrila Marina will delight you. Attractive location, even more attractive girls, hot summer nights, wide selection of alcohol drink, cocktails... everything that you are used to in Dobrila, you can experience in river club Dobrila Marina.